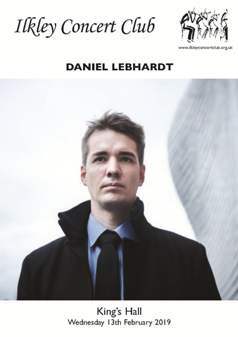 Our original artist was unfortunately unable to perform at Ilkley on this night, however we gained the talents of the up-and-coming Hungarian pianist, Daniel Lebhardt to play. We trust you will give him a warm Ilkley welcome! 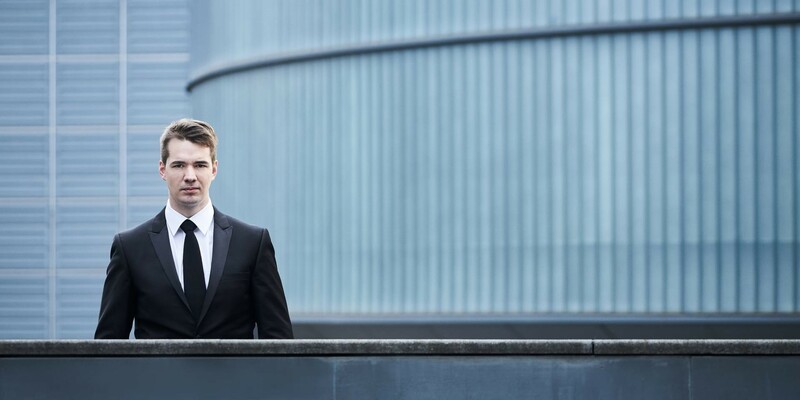 The young Hungarian pianist, Daniel Lebhardt, was a late replacement for last Wednesday’s recital at the Ilkley Concert Club. His playing was full of youthful fire and enthusiasm but with the pianistic pyrotechnics always at the service of the music. The packed audience in the King’s Hall did not take long to decide that his growing reputation is well deserved and by the end they had thoroughly taken him to their hearts. Daniel started with a performance of Bach’s Italian Concerto which was thrilling in the speed of its outer movements but retained the proper elegance of the central arioso. Lebhardt also excelled in bringing out the different voices from within Bach’s complex counterpoint. This was followed by Schubert’s delightful Drei Klavierstücke, a set of Impromptus left unfinished at his death. The three pieces were given appropriate characters with contrasting light and shade in the different sections including some beautifully hushed quiet passages. The first piece was full of brio in the allegros with a meditative central section; the second had an elegant lilt in the barcarolle and urgency elsewhere without losing the essential lyricism; the third was almost Beethovenian in the intensity which Lebhardt gave to its syncopations. Beethoven followed after the interval with the second of his early op. 2 sonatas, full of echoes of Haydn and Mozart but with harmony and drama typical of Beethoven. This is young man’s music and Daniel Lebhardt’s playing was beautifully judged – crystal clear runs and a wonderful legato – and, in the slow movement, the constantly returning rising bass figure precisely picked out. But the highlight of the eveniing was Rachmaninov’s second sonata, all its technical challenges and fearsome pianism carried through with exceptional skill and complete dedication. There was much to wonder at – sometimes giddying speed, chords of enormous power, but always room for contrast and the coaxing out of those melodies for which Rachmaninov is famous. Loud and insistent applause rightly followed and was rewarded by an equally entrancing performance of the G sharp minor Prelude. Bach Alfred Brendel plays the Italian Concerto, the Chromatic Fantasia & Fugue plus other shorter Bach works on Philips 475 7760 (medium price). This is a very satisfying CD. Schubert A 2 disc budget price set from Decca 438 7032 has Alfred Brendel, at his very best, with Piano Sonatas Nos. 19, 20 & 21 completing the set. Also recommendable is Paul Lewis on Harmonia Mundi HMC 902115/6 (2 discs at medium price). Piano Sonatas Nos.15, 17, 18 and 4 Impromptus complete the package. Beethoven One of the most recommendable sets of all the Beethoven Piano Sonatas, which also includes the Bagatelles, comes from Stephen Kovacevich on Warner Classics 9029586922 (around the price of 1 full price CD). Jenó Jandó on Naxos 8.550150 (medium price) gives “no frills” performances of the first 3 Sonatas which I find very satisfying. Rachmaninov The two Piano Sonatas are superbly performed, with excellent sound quality, by Xiayin Wang on Chandos CHAN 10816. Konstantin Scherbakov completes an excellent alternative with the Chopin Variations and Morceaux de Fantaisie on Naxos 8.554669 (medium price).